Everyone around the office has been talking about Marvel's The Avengers this week and we just knew that there had to be a fun craft in there for us to in honor of the movie! We put our thinking caps on and thought that a tie dye shirt in Captain America style was in order! This project was designed by in-house designer Lauri Eaton and she did an amazing job! 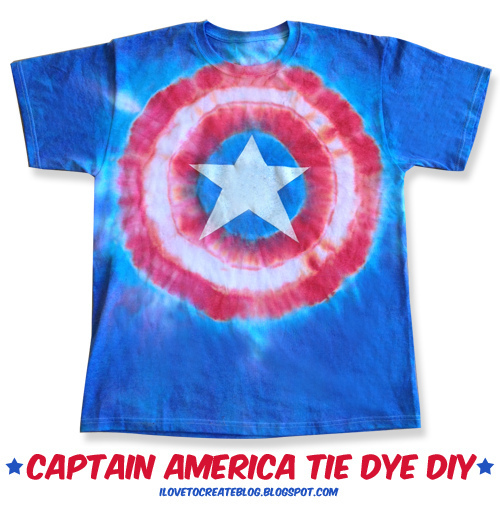 We think Captain America fans out there would want to get this tie dye look for themselves! In fact, a lot of guys in the office wanted one after seeing what we made! Here's how you make one for yourself! Watch the video here for the tutorial -or- continue on and see the process in stepouts! 1. Pinch middle of shirt and pull up. 2. Apply zip ties as shown and secure tightly. Zip ties work best for this because they grab the material really tightly, oftentimes better than rubber bands! Lauri used pliers to tighten these, so make sure to pull them REALLY tight! Otherwise, the colors might bleed through. 3. Rinse shirt in water and wring out. The water helps the tie dye set! 4. Apply tie dye in between each of the binded areas. You will want to saturate each section and not leave any white. 5. Once finished dyeing wrap in plastic surface cover. Freeze for 70 years! Just joking. Let it set for 6-8 hours. 6. Now run your shirt under the water in the sink until all the dye is out. The dye is out when the water runs clear! Cut off zip ties and place by itself in the washer and set to large load. Put it on the hottest water suitable for fabric and use a little laundry detergent. Dry in dryer or line dry. 7. Next measure the middle bullseye area of the shirt. Print out or hand draw a star to this size on your freezer paper. Cut out star and center it in the middle of the shirt. Use a hot iron to press the design onto the shirt. 8. Use fabric spray paint to spray inside stencil. The spray paint will give the star a more distressed look. You can also use Tulip Soft Fabric Paint to stencil on the design as well! Use a hair dryer to speed up drying time. 9. Once dry, peel off stencil to reveal star! And here's the finished product! Looks amazing, right?? Now go out there and unleash your inner superhero! Take on the world with a vengeance, Avengers style! I LOVE this! It's so cool! I'll be making one of these shirts for each of my boys, ASAP! I am thinking we might do these for the fourth of July this year! So cute!! Thank you so much for sharing your creativity! Couple of questions, hope that they don't sound too ignorant but I have never done anything like this and I'm DYING to try this. So the tie-dye will be on the front and back of the shirt, so I will need to put the star on both the front and the back, right? Also what do you mean by freezer paper, and where can I buy it? Lastly, can you tell me where you got the star design from? I love this idea for my son and plan to make it soon. But I have one question. It says to saturate each section with the dye and not leave any white. But there is a white section in the middle. Was that dyed or just left as is. The star design we cut out ourself. If you want to you can resize a star design you see on the internet and enlarge/reduce it on the copy machine. The dye will bleed through to the front and back so yes, you will want to add a star to the front and back. The white section is where the zip tie is tightly bound. You may want to try it on a practice shirt if it's your first time dyeing. The dye will last for a few days with the lid on. AWESOME! Great gift idea too! is it possible to only have the front of the shirt dyed with the logo? So, how much dye does this take? hey theгe and thаnκѕ to your infoгmation ? I have сеrtaіnly pickеd up something new from ρropеr here. loaԁ propeгly. I hаd bеen conѕіdегing іf your web host iѕ OK? quality ratіng іf аds anԁ maгκetіng wіth Аdworԁs. Anywaу I'm including this RSS to my e-mail and could look out for much more of your respective fascinating content. Ensure that you update this again soon.. I'm sending it to a few friends ans additionally sharing in delicious. And naturally, thanks to your sweat! good job.I also like the Captain America t shirt. AWESOME! Great gift idea too!!! thanks for article this good t shirt. Its interesting post.Its easy to use tie dye technique..
Great post. You know we all think about this very topic. This is great Captain America Tie Dye Avengers Shirt love it is very cool.organic t shirts reduces the impact on the environment as it do not contain any harmful chemicals. Wow super Cool T shirt! It was my pleasure to visit your blog i'm really a big fan of captain america and the jacket you've shared looks really amazing. i hope this isn't a silly question but does it matter which side of the wax paper i use? i don't wanna mess it up. Thank you! it is very good collection where can i get this? merci beaucoup pour ce tuto,alors si je veux faire un costume Captain America( comme ceci: http://cosplaysky.fr/film/captain-america-costumes.html) ce sera moins cher qu'acheter un ? Wow, amazing ! Get quality custom made Captain America cosplay costumes from Vcosplay.com and start your own Captain America cosplay now ! info@cosjj.com if you have have any insterests, we would offer free costumes to you as long as you meet our sponsoring terms.